Robotic surgery training methods are still in development, with increased recent interest with the introduction of simulators for training. However, published research in robotic surgery training has so far been limited to quantification of skill measures from ab-initio training of relatively short duration with a small number of trainees. These studies use the experimental tasks for both training and assessment. 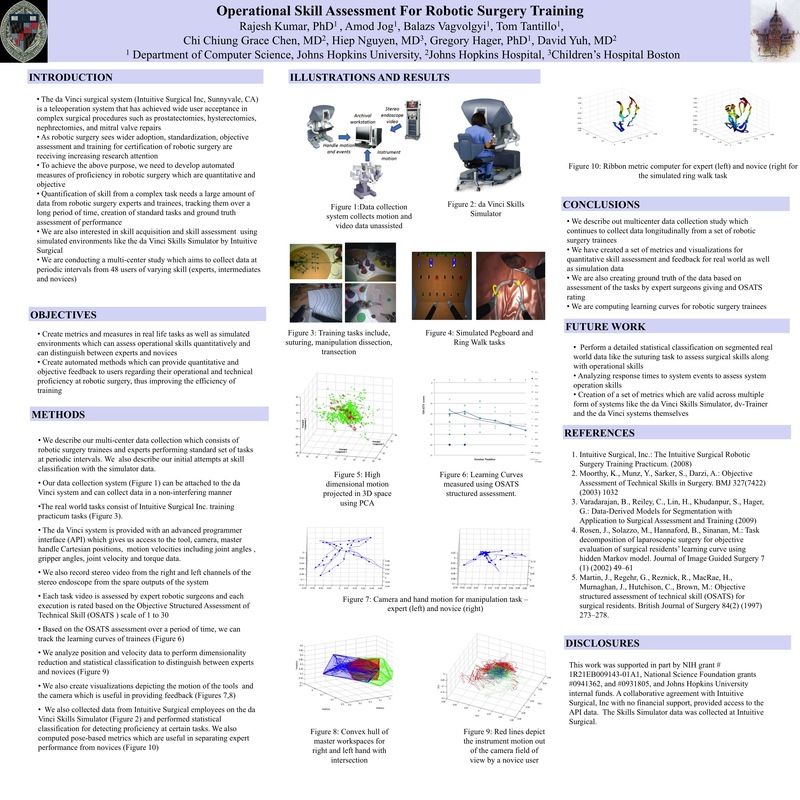 Robotic surgical systems require complex man-machine interactions and art has also not differentiated between clinical task skills and machine operational and technical skills.We describe a novel automated, objective framework for assessing man-machine operational skills in robotic surgery. Using a new portable recording system compatible with the da Vinci surgical system, we are longitudinally (monthly) acquiring stereo instrument video, time-stamped and synchronized with instrument and hand motion data from benchmarking tasks for 4 key minimally invasive skills – suturing, manipulation, transection, and dissection – for further offline analysis. Our ongoing protocol has already enrolled 27 trainees at four different training centers. Our subjects are robotic surgery experts, robotic surgeons, or are in training to become robotic surgeons. Longitudinal data from 12 subjects was analyzed, including an OSATS rating scale assessment by an expert, to establish objective differences in operational skills (OSATS>13 for experts, OSATS<10 for novices). Learning curves were established for a range of metrics including OSATS scores, task times, and instrument and hand motion measurements. Graphical representations of skills were also developed for providing feedback to the trainees. Early results demonstrate convergence of trainees towards the structured and automated measurements of the experts over the course of the training. Methods for providing detailed feedback to the trainees and mentors are now in development. This framework would be very useful in assessing trainee progress, and for developing training curricula and objective assessment standards for robotic surgery and training.